At Page-A-Day, we have the trickiest brain teasers, trivia, and games! If you love a challenge, try the Mensa® 365 Brain Puzzlers Page-A-Day Calendar and see if you can handle bootcamp for the brain: logic puzzles, spatial challenges, probability riddles, crosswords, encoded words, and so much more. 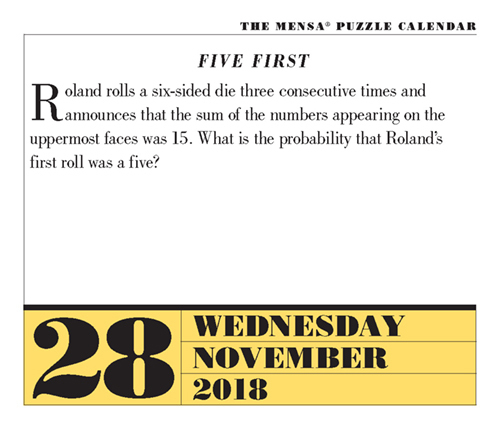 Roll the dice and see if you can answer today's Mensa Brain Puzzler! Mensa 365 Brain Puzzlers Spoiler alert - view the answer here. Get the trivia to keep your mind sharp and entertain your friends and coworkers. Think you know history, pop-culture, and sports? Prove it! Save 20% on your entire order with the discount code PUZZLE19. Can You Solve Today's Brain Puzzler? Can You Solve Today's Brain Puzzlers? It's National Thesaurus Day 2019! Celebrate 365 new words per day with Merriam-Webster.